The Duke of Edinburgh, Prince Philip, on Tuesday unveiled a monument on France's Normandy coast in memory of British soldiers who died during the D-Day invasion here 56 years ago. The 7-foot gray granite slab, set up near the Ouistreham ferry terminal, honored those in the Royal Navy and Royal Marines who lost their lives at sea and on the beaches as Allied forces burst onto Normandy's coastline on June 6, 1944. 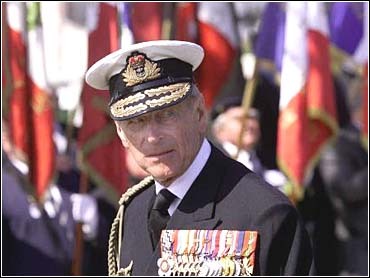 Prince Philip, Queen Elizabeth's husband, met with British and French veterans after the brief ceremony presided over by Simon Golding, chaplain of the British Royal Navy. Several other World War II commemorations took place over the weekend along France's coastline. On Sunday, Prince Charles visited the northern port town of Dunkirk to salute about 800 British and French veterans who escaped slaughter there by the German army 60 years ago. The association of Dunkirk veterans is disbanding this year. Also Sunday, a group of American veterans and their families traveled to Periers in Normandy to raise a monument to the U.S. 90th Infantry division and the more than 1,000 men it lost during the D-Day invasion. Among the biggest celebrations is a parade and ceremony Tuesday in New Orleans marking the opening of the National D-Day Museum. More than 10,000 World War II veterans are expected to attend. Meanwhile, an underwater search for wreckage and equipment from the D-Day invasion already is paying off. A spokesman for "Project Neptune 2-K" says after a week of searching off Normandy Beach, France, his team found a landing ship, almost completely intact. Researchers undertook the project because they were disturbed by reports that people were looting the battle's underwater artifacts.